Todays post is a little more of a diary insert than anything. The weather today has been terrible, one moment rain, then you think it has finally stopped and the sun comes out and suddenly its raining again. But this did give us a great opportunity to get some art done. 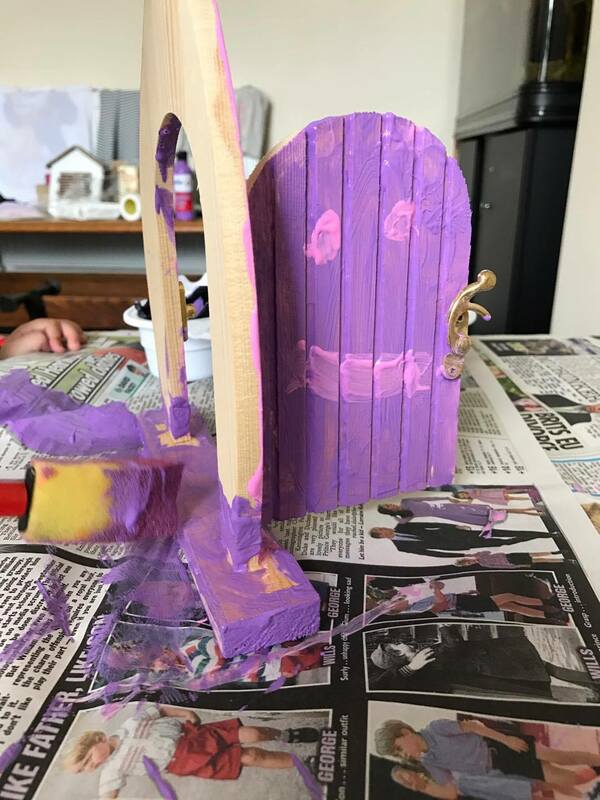 We haven't really been doing many arts and crafts due to getting to go outside and play more so when I told Lily we was going to be doing some painting she was super excited. We put her painting clothes on ready to get messy and got out her paints. Lily chose pinks and purples for todays painting. 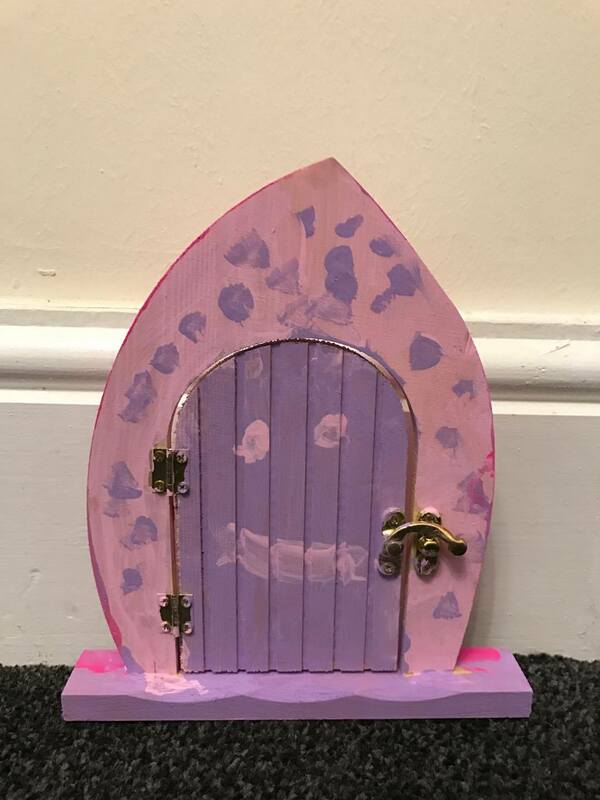 Lily has been wanting to paint her fairy door for a little while now but we have never managed to have the opportunity so today I got it out and said to Lily, "lets paint it!" 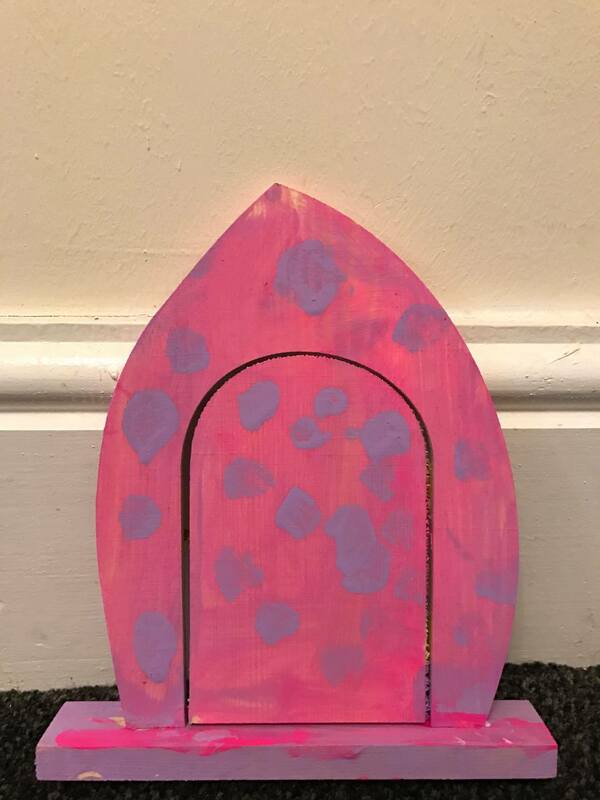 Lily is getting really good at painting now, she is a lot neater and understands about painting different sections of things, such as the door in one colour and frame in another. She also knows to fill in all the gaps and not leave parts un covered. Lily chose to paint the door purple and the bottom of the door purple. 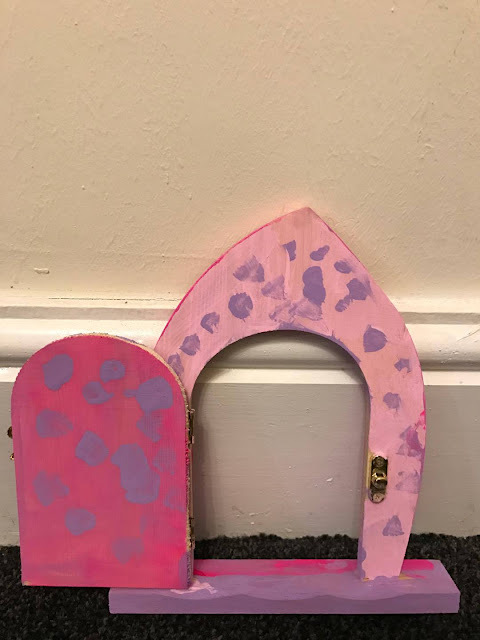 She painted the frame pink. She then said she wanted to put spots on it and also a smiley face on the door. She did a great job but it didn't come without the mess as she managed to get paint in her hair! 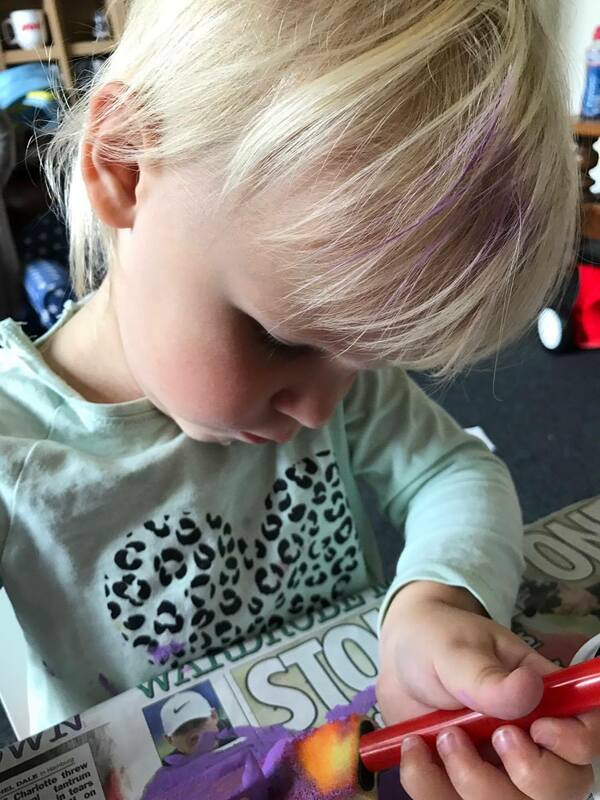 It looked like I had died part of her hair purple after it had dried in haha. She then painted the other side of the door and frame a pink colour and did purple spots on it. We then put it aside to dry. I have just checked it and it and its dry, It looks brilliant and Lily is going to be really excited to see it in the morning. 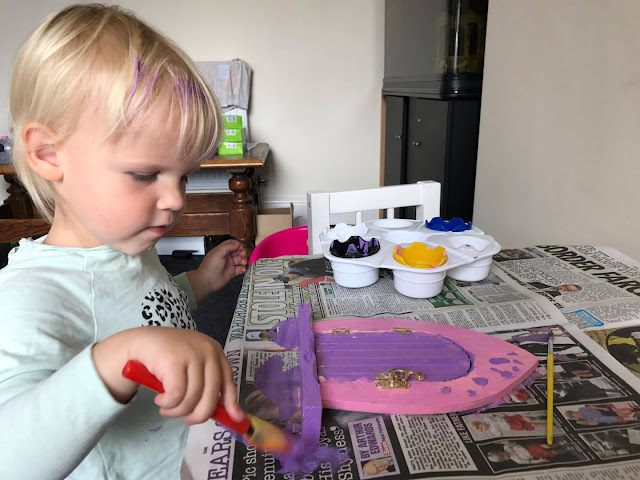 Do you enjoy painting with your children? What sort of things do you paint? That is a wonderful fairy door. My daughter loves painting whatever she can. She even helped a bit when we painted her bedroom. Great job. Love dotted design. Yes, we all enjoy arts and crafts. I do like the Fairy Door. Lily has chosen a lovely colour combination. We tend to paint pictures, etc. First time I came across Fairy Doors was on a walk :- There was a walk not far from a hotel in which we were staying for the weekend. We decided to go for a walk as it seemed like countryside :- green grass, trees, bushes,etc. As we continued the walk we were surprised to come across a variety of colourful fairy doors agai st some tree trunks. It looked lovely. Later I have come across the products in some shops.